Published: December 2016 - by Createspace. Source: Thank you to the authors for sending me this book in exchange for an honest review. In 1995, at the age of eight, Una Waters survived a terrifying encounter at 30,000 feet aboard Flight 564 from Dallas to Las Vegas. It changed her forever. After 21 years, and a decade away from the Hopi Reservation where she grew up as a child, a surprise plea for help brings Una back, to solve a mystery that threatens their traditional way of life. The U.S. Army's sudden interest regarding a cave discovery in the Sacred Peaks has triggered alarm, leading to violence. With the help of friends, new and old, Una must confront her painful past, seek proof to qualify the ancient site for protection under law, and stand up to a stiff-necked general, whose agenda is more concerned with retrieving a mysterious power source. This was a fun book! It's quite different from the books I usually read, and although it didn't blow me away, it was a fun, solid novel that kept me entertained. The writing is good, and although it's in third-person the narration is smooth and very engaging. The scenes are strong and easy to place, and there's just the right amount of description for them to be vivid but not overwhelming. It's a sparkling story. Richly, deeply researched, and overflowing with diversity and a side of history I've personally never heard about. I really enjoyed getting a glimpse into Hopi culture and way of life, and the story makes the facts interesting. But it is a very complicated story, and in part due to the structure (which I'll get to in a bit) it does get very confusing towards the end. I honestly struggled to understand the ins-and-outs of Una's mission. One of the biggest issues with this book is the structure. It's a mess, with no clear plot points and terrible direction. There's also far too much exposition, and the info dumps unload information that's cluttered, complicated, and hard to follow. I was frequently confused. The dialogue glows with characterization, but unfortunately it's also rather on-the-nose. That gets distracting as the story goes on, and it personally irritated me. The main characters are clearly defined and Una is a strong and capable heroine. She grows a lot throughout the course of the book and has a nice heap of back story, but I also felt like she was missing something. Maybe I would've liked to have seen more of her childhood and relationship with her parents (which is so frequently referred throughout the story) instead of it just being mentioned and addressed in the story. I needed the hint of back story, and I needed to see it in action. I didn't feel like that was properly balanced. The romance is basically nonexistent, and that left me with mixed feelings. On one hand, it's nice to see Una's motivation so focused on her people, and yet it's also hard to believe Jack and Una's friendship is so completely clean. Their relationship lacks even the commonplace male-female sexual tension, and is so completely neutral that it feels unrealistic. That was something I struggled to understand. 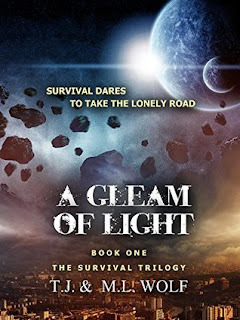 A Gleam of Light is a rich, solid story sparkling with engaging writing and historical detail. But the structure is a mess, and the plot itself could use a lot of work. It's a good book, but not an amazing one. This book sounds interesting, even with the problems you mentioned, but I have to ask, do you think you'll read books 2 & 3? I sometimes hesitate to start a trilogy because I find it so hard to finish them lately. Umm, not sure. I don't think I will. 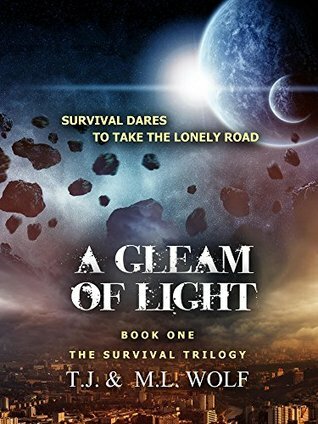 Speculative fiction is something that needs to be delved more into, and even though this only has a three rating, it seems like a good entry into the genre!